This is such a super busy, stressful time of year for most people. The festivities in November and December are overwhelming: Diwali, Hanukkah, Christmas all come within weeks of each other. And each of those festivities are accompanied by cooking, baking, shopping, office parties, school concerts, music concerts etc. To help get through it all without getting sick, or super stressed, it’s super important to take care of yourself during these hectic months. Eat healthy, stick to a regular bedtime schedule and try and get some exercise, even if it’s a 30 minute walk in the sunshine during your lunch. Whenever I go out to do errands, I always try to take a hot mug of tea, or a bottle of water and a small snack. 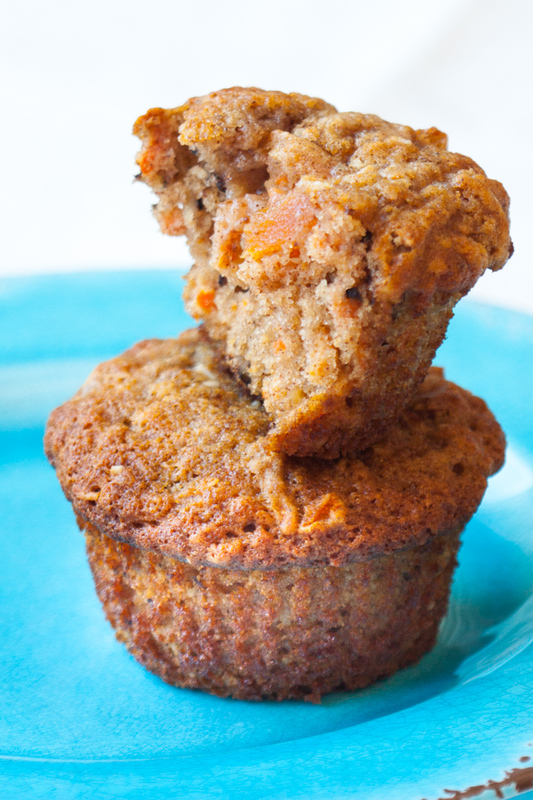 These On the-Go Carrot, Apricot, Walnut Muffins are perfect for that. 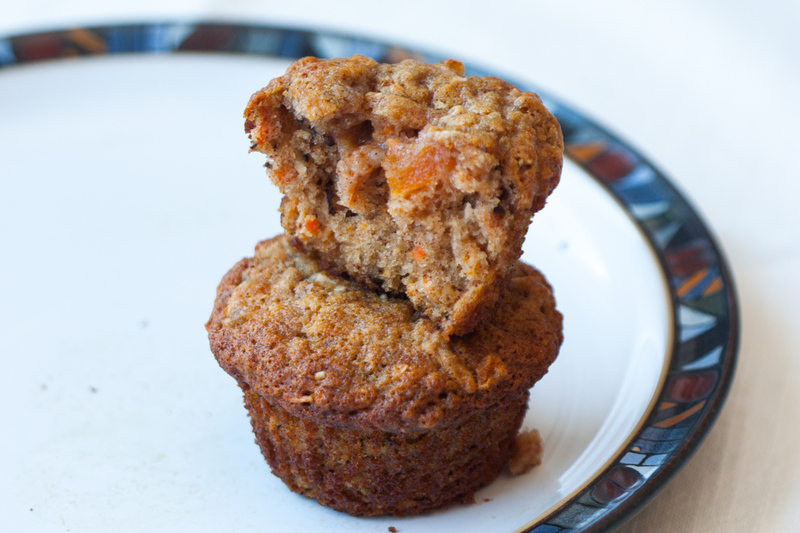 Besides carrots, apricots and walnuts, they also contain coconut and applesauce. When I bring my own snack, I am less tempted to buy a high calorie snack and sugar laden coffee at the corner coffee shop. This saves me a ton of money and I know I’m eating something healthy. 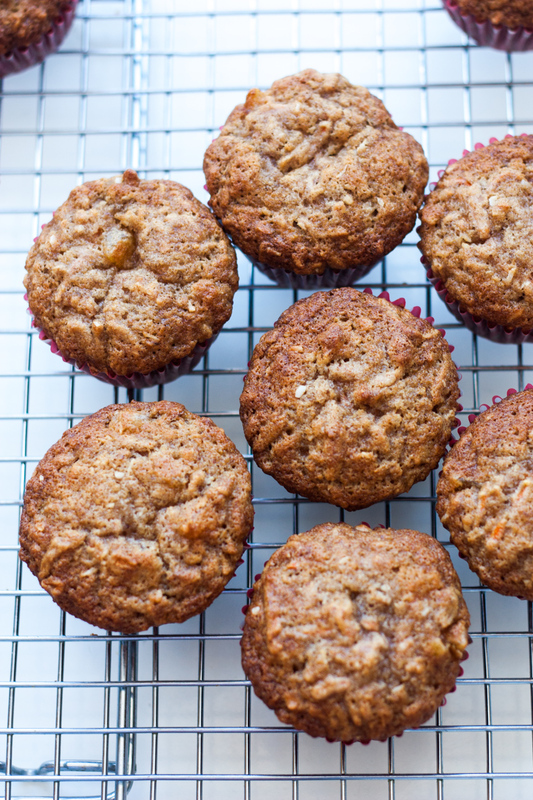 These muffins freeze really well. When you’re heading out, you can just pop a muffin in a container to take away with your favourite on-the-go drink. It will thaw out and be ready to eat within 30-40 minutes. Packing a snack is a good habit to get into even if you’re just going out for a couple of hours. I hope you enjoy them! And Happy December! I really liked these stress relieving tips. My favourites from this list were walking, enjoying the sunshine and laughter. If you find any of the tips helpful, please share! Fill muffin tray with paper cup liners. In a separate bowl, mix together the oil, applesauce and eggs. In a third bowl, mix together the carrots, walnuts, apricots and coconut. Add the carrot mixture to the dry ingredients. Add in the oil/applesauce and egg mixture. Stir briefly until everything is combined. Fill muffin cups 2/3 full. You should be able to fill about 16 cups. Place muffin tray in oven. Bake for 20 minutes. Muffins should rise nicely and be golden brown when done.